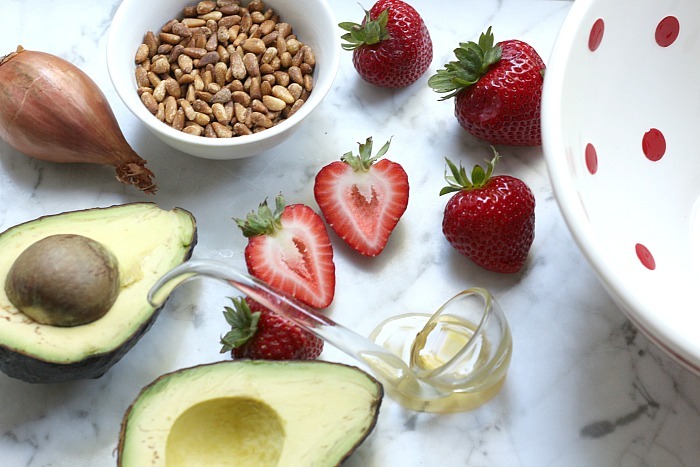 It’s a beautiful thing when superfoods come together to make something incredibly delicious. 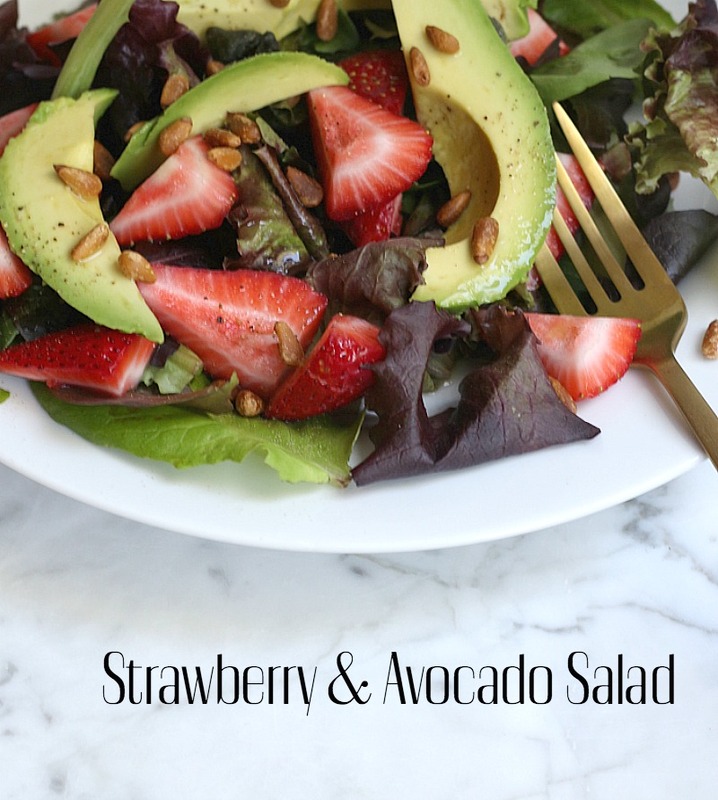 I saw a photo for a Strawberry & Avocado salad from health.com that looked so incredible, I wanted to make it. The photo was a good reminder that you truly eat with your eyes first. 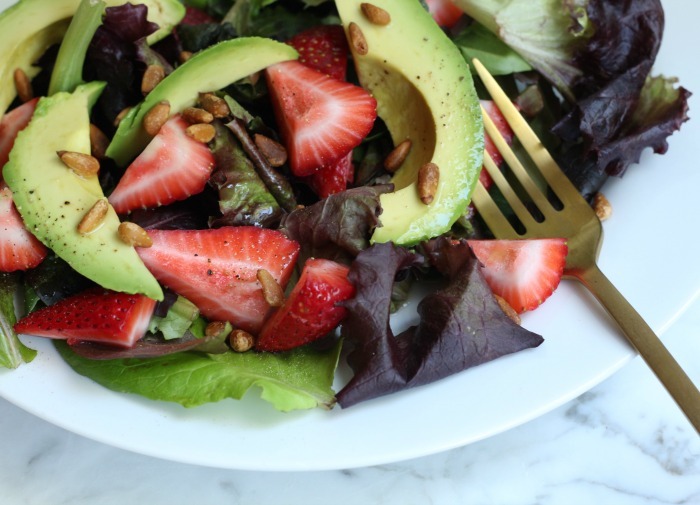 This salad contains strawberries, baby lettuces, avocado and roasted pine nuts. It is fresh and buttery all at once and the vinegar adds a slight tang to balance the smoothness of the avocado. Individually, I love all the ingredients so I was really curious to see how these flavors combine. This salad is a mix up of unexpected ingredients that complement one another really well. I have to admit that I’m not very inventive when it comes to experimenting with food combinations and admire people who have a knack for it. It’s probably one of the reasons that I’ve been known to binge watch the Food Network. I’m fascinated with food and have such a deep respect for chefs who are passionate about their craft. Last night, I finally got around to watching the movie, The Hundred-Foot Journey. It has been on my bucket list ever since I watched Julie & Julia, another great movie about mastering cooking techniques. Movies like those open my eyes to an entirely new world where people take culinary art to remarkable levels. Below is the recipe that I adapted from heath.com, it’s quick and easy to make and great for summer entertaining! Stir together diced strawberries, shallot, vinegar, honey, salt and pepper in a large bowl. Let stand for 15 minutes. Slightly mash with a whisk. Whisk in oil, reserve 2 tablespoons for the dressing mixture. 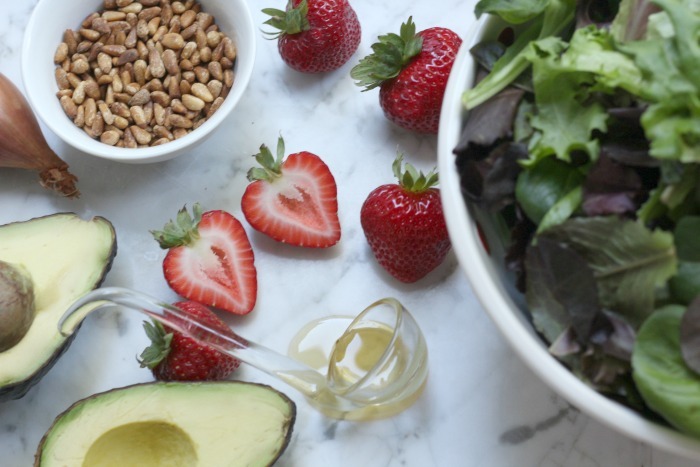 Add lettuces and quartered strawberries to dressing mixture; toss to combine. Transfer to a platter or individual plates top with avocado slices and pine nuts. Drizzle with reserved dressing.